Not to be confused with Rayners Lane. Raynes Park is a residential suburb, railway station and local centre in Wimbledon and is within the London Borough of Merton. 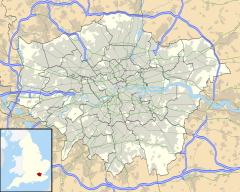 It is situated south-west of Wimbledon Common, to the north-west of Wimbledon Chase and to the east of New Malden, in South West London. It is 8.2 miles (13.2 km) south-west of Charing Cross. Towards the north and west, either side of the borough boundary with the Royal Borough of Kingston upon Thames are the areas of Copse Hill and Coombe with their large detached houses, golf courses and gated lands. Raynes Park had a population of 19,619 in 2011, which refers to the populations of the wards of Raynes Park and West Barnes. Raynes Park is 8.2 miles from Central London and has one of the largest proportions of green open space in South West London. The area has a number of parks including Cottenham Park Recreation Ground, named after Charles Pepys, 1st Earl of Cottenham, and Cannon Hill Common. Cannon Hill Common covers 21 hectares of open space, and is a site of borough importance – Grade 1 for Nature Conservation. It contains mature woodland that is over 140 years old and provides a habitat for a variety of fauna and flora. For earlier history see Merton and Wimbledon. Historically, the area of Raynes Park south of Coombe Lane and Kingston Road was part of the parish of Merton and the area north of that line was part of the Parish of Wimbledon. The area remained rural until late into the 19th century. The first development in the area was the opening of the London & South Western Railway in May 1838 which crossed the area on a high embankment, although the station did not open until later. Cottenham Park to the north of the station was the first part of the area to be laid out for development in the 1870s. It takes its named from Charles Pepys, 1st Earl of Cottenham who lived in Wimbledon until his death in 1851. The name Raynes Park was originally used in the 1870s and only applied to the area south of the railway line where the local landowner, Richard Garth, Lord of the Manor of the adjacent parish of Morden, planned to develop a new garden suburb similar to that being developed by John Innes at Merton Park to the east. The name refers to the Rayne family, the previous landowners of the farmland on which Garth intended to build. Garth laid out the northern section of Grand Drive, about as far south as Heath Drive, and Blenheim Road and persuaded the railway company to build the station. A number of detached houses were constructed, but Garth's absence as Chief Justice of Bengal slowed the development and much of the rest of the area became a golf course and cricket grounds. By the late Victorian period the residential development of Wimbledon was encroaching on the north side of the railway from the east but, apart from a few buildings including the Junction Tavern and a school, development around the station did not start until the beginning of the 20th century. South of the railway, the twelve terraced roads known locally as "the Apostles" (although they are not named after the Apostles) were laid out over a former cricket ground starting during the Victorian period. In the 1920s, the Kingston Bypass (A3) and its spur, Bushey Road (A298), were built as dual carriageways. South of the railway, the majority of residential development occurred in the 1930s with Grand Drive being extended south into Lower Morden and new roads being developed. Much of the area remains open space. During World War II the area suffered considerable bombing, especially in 1944 from the V-1 flying bomb. Raynes Park station is on the National Rail network. The station is at the junction of the branch line heading towards Epsom and Dorking and has four platforms. A distinctive local landmark is the station footbridge which spans all four main running lines at an angle of about 45 degrees. Another distinctive feature of the station is that the platforms are not opposite each other. The station benefits from frequent train services to central London, with approximately 210 trains to Waterloo each day, averaging about 12 per hour during service hours. Raynes Park is effectively divided into two by the Waterloo - Southampton mainline railway. In recent years, Raynes Park has benefitted from increased investments; this includes a large Waitrose. Raynes Park has London bus services running through Wimbledon to Colliers Wood, Tooting, Streatham and to New Malden and Kingston upon Thames, as well as nightbus services to Wandsworth, Vauxhall, Westminster and Aldwych. Bushey Road connects the Kingston Bypass to Wimbledon Chase and Merton Park. On the south side is Prince George's playing field which plays host to Sunday league football. The field also has other purposes and has in the past held travelling Funfairs and Hindu festival celebrations. Adjacent to the playing field is a sports and leisure centre. The area has a number of other parks and open spaces including Cottenham Park Recreation Ground and Raynes Park Sports Ground. The nearest London Underground tube station is Wimbledon on the District line. Raynes Park has a Non-League football club Raynes Park Vale F.C. who play at Prince George's Fields. Other leisure facilities in the area include the Raynes Park Residents Lawn Tennis Club, and the Malden Golf Club. The Malden Golf Club was founded in 1893 and the parkland course is set over an area of 120 acres. Wimbledon United CC have fielded a number of Sunday cricket teams with great success at their home ground at Cottenham Park for the past 90 years. Cannon Hill Common is popular for walking, cycling, recreational fishing and angling, dog walking, bird watching and represents a small piece of countryside within the city of London. Since 2010 the MyRaynesPark Festival has taken place annually for a week during the summer, providing arts and cultural events for the local community. Wimbledon Volleyball Club is based at Raynes Park High School. ^ "Merton Ward population 2011". Neighbourhood Statistics. Office for National Statistics. Retrieved 11 October 2016. ^ "Vision of Britain - Parish of Wimbledon". ^ a b "History: Building Raynes Park - Raynes Park and West Barnes Residents' Association". www.rpwbresidents.org.uk. ^ "War and peace and the price of cat-fish". myunclefred.blogspot.com. ^ "War and peace and the price of cat-fish". myunclefred.blogspot.co.uk. ^ "Raynes Park Vale". www.pyramidpassion.co.uk. This page was last edited on 10 April 2019, at 22:14 (UTC).